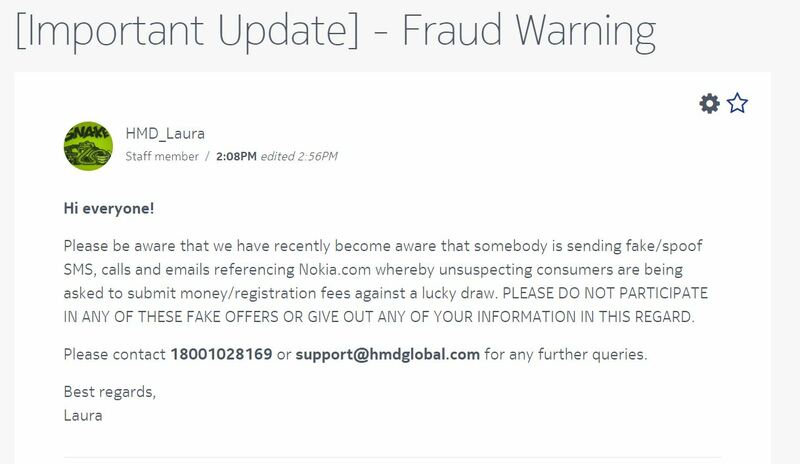 Nokia Mobile moderator on the Community Forum warned users of a hoax currently taking place in India, where users receive via text, email or calls invites for a “lucky draw” that claims to be connected with Nokia. User nmgo3 on Community Forums posted on the same thread screenshots of the received SMS, that mentions “Nokia.com” twice. He also received a call from +91 72500 52165 from someone claiming to be an employee of Shopclues.com, so be aware of that too. For any further questions HMD suggests contacting 18001028169 or support@hmdglobal.com. It’s troubling that, per community member nmgo3, both he and his aunt received the SMS on their Nokia phone, which clearly means that the fraudsters new that their targets have a connection with Nokia, thus making it look like Nokia is organizing the “Lucky draw”. If you received such SMS or via an other kind of medium, don’t reveal your personal data at any cost and block the sender. Reporting the number to your operator (that usually blocks such numbers on their networks) could be helpful, too. 3 unknown #Nokia devices certified in #Russia. Could it be the 7, 8 and 9?